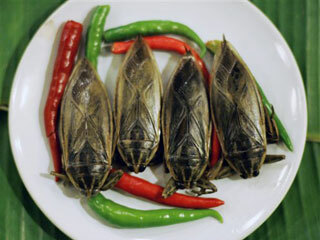 Once again a UN conference has come up with a brilliant plan to solve the pressing problem of famine: just eat bugs. “A Japanese scientist proposed bug farms on spacecraft to feed astronauts, noting that it would be more practical than raising cows or pigs. Australian, Dutch and American researchers said more restaurants are serving the critters in their countries.The U.N. Food and Agriculture Organization estimates 1,400 species of insects and worms are eaten in almost 90 countries in Africa, Latin America and Asia. Researchers at the conference detailed how crickets and silk worms are eaten in Thailand, grubs and grasshoppers in Africa and ants in South America. “In certain places with certain cultures with a certain level of acceptance, then insects can very well be seen as part of the solution” to hunger, said Patrick Durst, a Bangkok-based senior forestry officer at the FAO. Why do we continue to fund these clowns?